Those sales grew from the billions of shopping micro-moments that power today’s buying economy. Fewer people wait to head to the mall on Saturday to go shopping; thanks to smartphones, shopping now happens anytime and anywhere. Read on for the latest ways we’re helping retailers reach shoppers in those crucial I-want-to-know, I want-to-go, and I want-to-buy moments. We're improving the mobile experience on Google to aid shoppers as they browse, compare, and research products. 1 in 5 people swipe to interact with shopping ads, expressing a strong desire to learn more.2 So we’re rolling out a new enhancement that gently expands the shopping ads as you swipe, revealing information like product ratings and availability at a nearby store. The result: more qualified traffic driven directly to retailers. This feature will begin rolling out on Chrome for Android this month, with iOS to follow in the coming months. 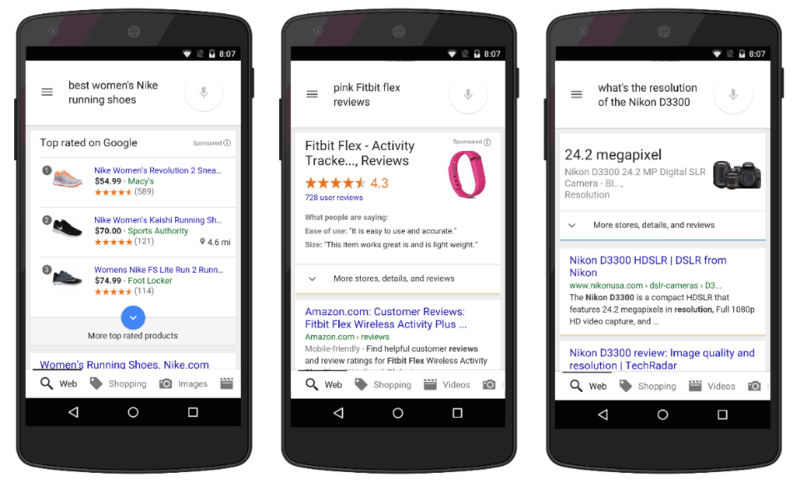 Conversational search is also really important -- we’re seeing more shoppers literally asking Google to help them learn more about products. So we’re rolling out new experiences that answer them right back. On searches for the top-rated products, such as “Best women’s Nike running shoes,” we’re starting to show newly-designed shopping ads with authoritative rankings and product ratings. The new design is so helpful to those specific users that we've seen click-through-rate increases of up to 11% for retailers for these queries.3 Product queries that include “reviews” or “recommendations" are also increasingly common, so we’re showing new product review cards with product ratings and snippets from the most useful reviews from around the web. Finally, shoppers who want to learn more about a product’s features, like the resolution of the camera they’re considering purchasing, may now see a product attribute card with the most relevant information. 1 in 4 people who avoid stores say they do so because they don’t want to waste their time finding out that the thing they want isn’t in stock.4 So we’re doing more to serve people who clearly want to focus on products that are available within driving distance. What if you could give shoppers the right information at the right time – without them even needing to ask? Google Now does just that by bringing people the information they need at the moment they need it. We’ve recently released two new cards for shoppers. The Google Now in-store card appears when a shopper is near a store, displaying useful information such as sales, closing hours, loyalty card data, and more. When she clicks “Search store inventory,” a Google-hosted, retailer-branded local storefront allows her to browse that store’s shelves 24 hours a day. Also newly available is the Google Now price drop card. This card highlights a significant price reduction on a product the shopper has previously browsed, giving her a compelling reason to make that purchase now, online or in-store. US retailers’ conversion rates on desktop computers are 2X higher than on mobile.7 So we’re working on new solutions to help retailers increase mobile engagement and sales. There are lots of great shopping apps out there, and we want to encourage shoppers to use them. That’s why we’re starting to work with a select group of global retailers including eBay, Flipkart and Zalando to add deep links to their apps right in their shopping ads, driving people straight to their mobile app instead of their website. This is a tremendous new opportunity for retailers and app developers to drive engagement with their shopping apps, and we’ll be expanding it to more advertisers in the coming months. 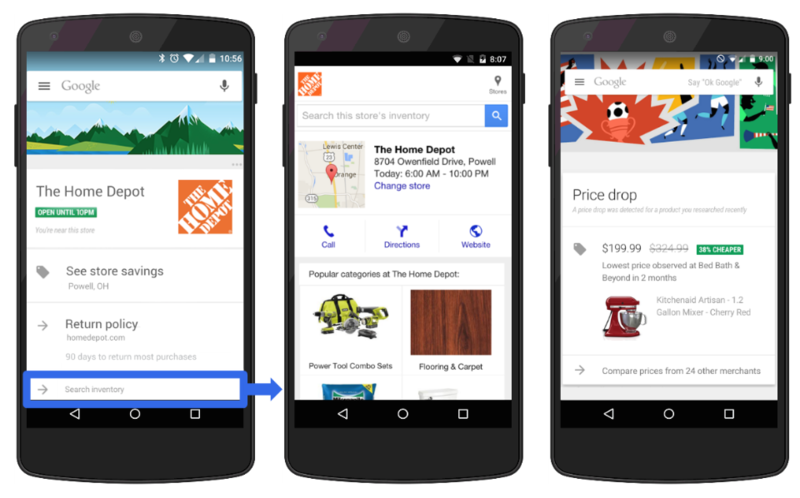 Finally, to help smartphone shoppers buy with ease from their favorite retailers, we'll be testing Purchases on Google. When a shopper searches on mobile for a product such as “women's hoodies”, she may see a shopping ad with 'Buy on Google' text. After clicking the ad, she's taken to a retailer-branded product page hosted by Google. Checkout is seamless, simple, and secure, thanks to saved payment credentials in her Google Account. 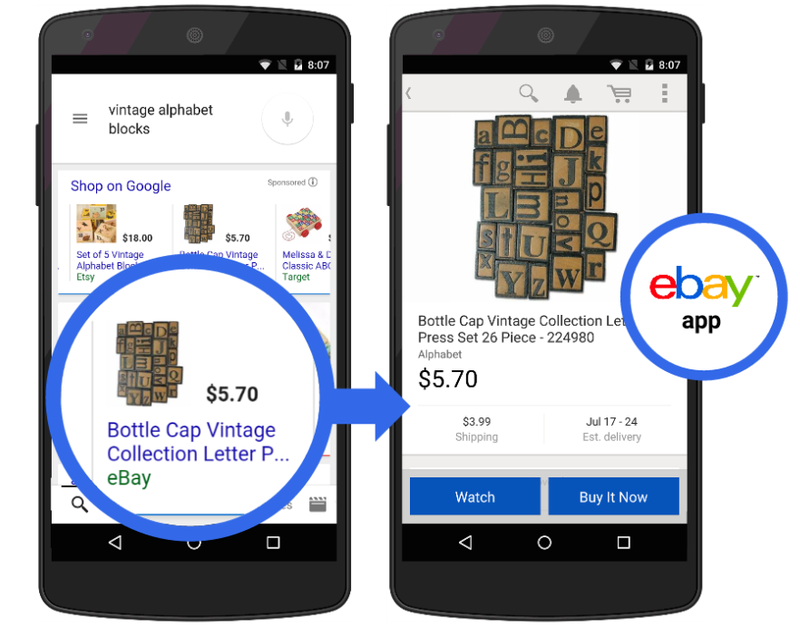 For retailers, opting in to Purchases on Google means improved mobile conversions thanks to a simplified checkout process. Participating retailers only pay for clicks on the shopping ads to the product page; all clicks and interactions on the product page are free. While Google hosts the product page and provides purchase protection for customers, retailers own the customer communication and can offer customers the option to receive marketing and promotional messages. “Customers increasingly want to shop on their own terms. Purchases on Google facilitates that flexibility while maintaining the merchant’s ability to own the customer relationship.” says, Peter Cobb, eBags Marketing EVP and Shop.org Chairman. With shoppers today, big expectations come from the smallest moments. That's good news, because retailers now have the technology to deliver on those expectations. The tools we shared this week can help retailers be there in those billions (and trillions!) of micro-moments with the right experience, and in the right context, to win the moments that matter the most. To learn more about Google’s solutions for retailers, visit google.com/retail or contact your Google account manager. 1Deloitte, Navigating the New Digital Divide: Capitalizing on Digital Influence in Retail, May 2015. 2 Google Shopping internal data, Q2 2015. 3 Google Shopping internal data, Q1 2015. 4 Google, Ipsos MediaCT and Sterling Brands, Digital Impact on In-Store Shopping, May 2014. 5 Google Shopping internal data, randomized user A/B experiment using Adwords Conversion Tracking for mobile and desktop, controlling for product mix and excluding local-only products, June 2015. 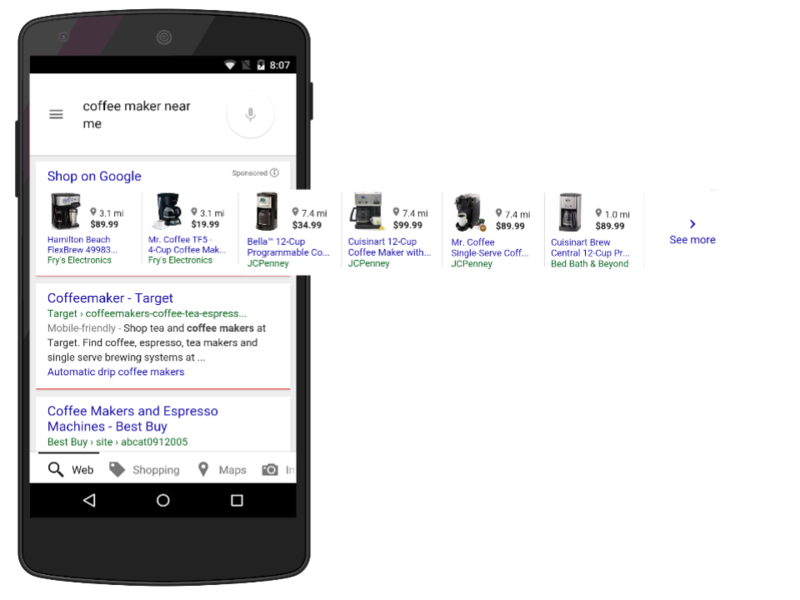 6 Google Shopping internal data, randomized user A/B experiment, June 2015. 7 Aggregated data from Google Analytics for the US retail vertical, May 2015. Last year, mobile devices used before or during shopping trips influenced just under one trillion dollars — or 28% — of in-store sales in the United States.1 Those sales grew from the billions of shopping micro-moments that power today’s buying economy. Fewer people wait to head to the mall on Saturday to go shopping; thanks to smartphones, shopping now happens anytime and anywhere. Read on for the latest ways we’re helping retailers reach shoppers in those crucial I-want-to-know, I want-to-go, and I want-to-buy moments.